Marble Canyon, Bridge of Sighs, Boaters. Photo Courtesy of Emery Kolb Collection.The Cline Library at Northern Arizona University invites applications for the 2018 Elizabeth M. and P.T. Reilly Internship. 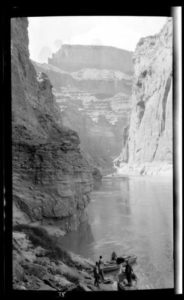 The 2018 Reilly intern will work closely with Cline Library’s Special Collections and Archives staff to develop physical and virtual exhibits that celebrate the centennial anniversary of the Grand Canyon as a national park. The library is seeking a highly motivated and organized student to work in collaboration with Special Collections and Archives staff to develop the exhibits. The intern will draw on the vast and rich resources housed in the Cline Library Special Collections and Archives. 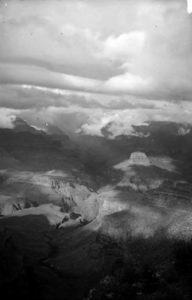 The Cline Library Special Collections and Archives contains one of the most comprehensive collections of Grand Canyon and Colorado Plateau history in the world. The department has over 200 collections, containing millions of photographs, correspondence, journals, maps, films, and oral histories, that document the human and natural history of the Grand Canyon from a wide variety of perspectives from the 19th century to the present. Collections of note include the collections of Emery Kolb, Plez Talmadge Reilly, Martin Litton, the Fred Harvey Company, William Wallace Bass, Bill Belknap, Edwin McKee, the Verkamp Family, and many others. 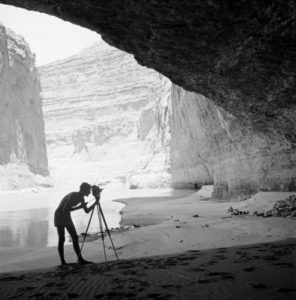 Tad Nichols, Red Wall Cavern. Photo Courtesy of PT Reilly Collection. The library envisions the exhibit as a retrospective examination of the human and natural history of the Grand Canyon from the late 19th century prior to it becoming a national park, to its designation as a national park in 1919 and the subsequent 100 years as a national park. We will be particularly focused on the areas of park administration, exploration, land use, tourism, politics, and economics within the above noted period. Duties and Opportunities: The 2018 Reilly intern will assume primary responsibility for the virtual (web-based) exhibit. The intern will also provide significant support for development of the physical exhibit, from its interpretive text to design and fabrication. The Reilly intern will work 40 hours per week for ten consecutive weeks. The successful candidate will select a ten-week block between May 14 – August 10, 2018. The workweek schedule offers some flexibility. Clouds over Grand Canyon. Photo Courtesy of Emery Kolb Collection. Stipend and Housing: $4,500 (no benefits included) total. The Reilly intern will be paid in bi-weekly installments to reach the total of $4,500. On-campus housing is subject to availability. For more information, please consult https://nau.edu/Residence-Life/Housing-Options/Summer-Housing/. Renting a room in the community is also a possibility. The successful candidate must be willing to relocate to Flagstaff for ten weeks and underwrite his or her own food, lodging, transportation to work, and parking. Qualifications: The preferred candidate will be a graduate student in information science or museum studies working toward a career in a library, museum, or archives setting. Graduate students should be currently part of a program with an anticipated completion date of August/September 2018 or later. Undergraduate (junior or senior) students studying applied indigenous studies, geography, history, forestry, anthropology, parks and recreation management, or other appropriate area are also encouraged to apply. For more information, contact Peter Runge via email at peter.runge@nau.edu or phone at (928) 523-6502. The mission of Cline Library’s Special Collections and Archives Department is to collect, preserve, and make available archival materials that document the history and development of the Colorado Plateau. Interdisciplinary in nature, the collections include 7 million manuscripts, 1 million photographs, 35,000 books, 2,000 maps, and 1,300 oral histories. Learn more at http://archive.library.nau.edu. Flagstaff is a city of 67,000 at the base of the San Francisco Peaks surrounded by the Coconino National Forest. Approximately 80 miles from Grand Canyon and 140 miles from Phoenix, Flagstaff enjoys a four-season climate at an elevation of 7,000 feet. NAU has a growing diverse student population and is committed to Equal Opportunity/Affirmative Action.